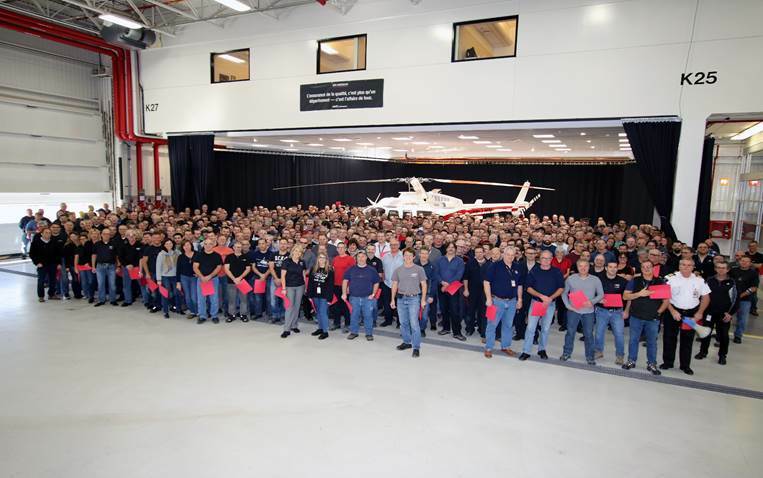 Bell Helicopter, a Textron Inc. company, announced that the company’s Canadian Facility located in Mirabel had completed its 5,000th aircraft. The aircraft, a Bell 407GXP, will be owned by China’s Shaanxi Helicopter Co. Ltd., which had signed a purchase agreement for 100 Bell 407GXPs in 2017. Bell Helicopter continues to set the pace for developing advanced aircraft and finding innovative solutions for both Commercial and Military markets. Bell Helicopter opened its Mirabel manufacturing operations in 1986 and the facility is the Final Assembly and delivery site of the majority of Bell’s Commercial product lines including the Bell 505 Jet Ranger X, 429, 412EPI and 407GXP. Bell Helicopter, a wholly owned subsidiary of Textron Inc., is an industry-leading producer of Commercial and Military, Manned and Unmanned Vertical-Lift Aircraft and the pioneer of the revolutionary Tiltrotor Aircraft. Globally recognised for world-class customer service, innovation and superior quality, Bell's global workforce serves customers flying Bell Aircraft in more than 120 countries. Textron Inc. is a multi-industry company that leverages its global network of Aircraft, Defence, Industrial and finance businesses to provide customers with Innovative Solutions and Services. Textron is known around the world for its powerful brands such as Bell Helicopter, Cessna, Beechcraft, Hawker, Jacobsen, Kautex, Lycoming, E-Z-GO, Greenlee, Textron Off Road, Textron Systems, and TRU Simulation + Training.